Looking for inspiration? Our developer community is constantly pushing the boundaries of what's possible with 3D Printing. Here are some examples of what you can do with the ShapeJS language and what's possible with 3D printing. 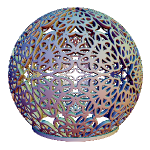 This is an example of a gyroid pattern intersected with a sphere. 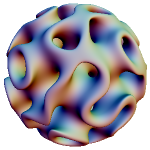 A sphere is intersected with a space filling pattern. The pattern used here is a Gyroid which makes nice patterns through the space. 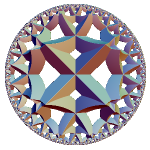 Example of generalized kaleidoscope. The idea is similar to traditional kaleidoscope, which consists of 3 flat mirrors with dihedral angles 60 degree. One can place an arbitrary objects inside of such kaleidoscope and reflections in the mirrors create infinite repeating pattern. Here in addition to usual flat mirrors we use spherical mirrors. "Reflections" in spherical mirrors are inversion in the spheres. If dihedral angles between spheres and planes is integer submultiple of the half turn (PI or 180 degrees) the reflections in such mirrors form regular pattern. The type of pattern created by such kaleidoscope can be wildly complex. In this case we have 4 mirrors: 2 flat mirros and 2 spherical mirrors. The mirrors are placed in such a ways, that the pattern scales down near the boundary of a disk. It resembles a tiling of 2D hyperbolic plane in Poincare disk model with important difference that our pattern is three dimensional. A signet ring where the user can provide the image for the ring. 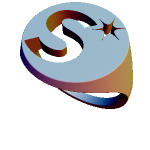 The script is fully parameterized for creating different ring sizes and widths. 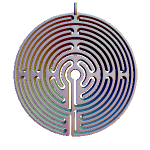 A pendant creator for making flat and circular image based pendants. Using a spherical or cylindrical bending makes these pendants pop. 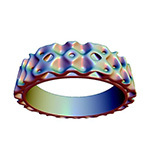 A ring created from volumetric paterns. Contains lots of parameters to allow an exploration of the space. No everything is printable here so watch your designs carefully for wallthickness issues. 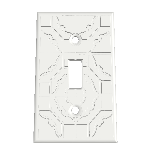 Create a custom LightSwitch cover using an image. This example shows how to protect functional areas of a design from the input image. 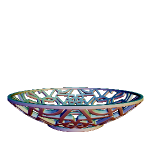 Create a candy dish with a single image. This polyhedral kaleidoscope takes a source image and maps it onto a sphere. The reflections turn simple imagery into complex patterns. Here is a Tutorial on how to create the images. Create a custom LED tea light with a single image. This polyhedral kaleidoscope takes a source image and maps it onto a sphere. The reflections turn simple imagery into complex patterns. We recommend using images sized 1618 x 1000 pixels. 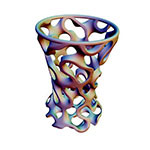 A toothbrush holder created from a profile image that is revolved around a circle and then intersected with a volume pattern. Can also be used to make other items such as a vase, candelsitck holder, or a wineglass. 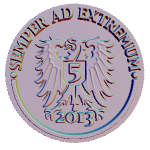 A coin created from multiple 3D image layers combined to create a top, a side and a bottom surface. 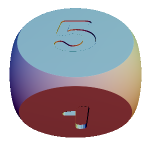 A six-sided dice made from a simple cube intersected with a sphere to round the corners and edges. Numbers for the dice are created with the Text object, rotated and translated to each face, and subtracted from the dice. Create a custom holiday ornament with a single image. 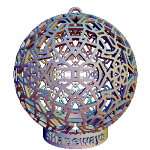 This polyhedral kaleidoscope takes a source image and maps it onto a sphere. The reflections turn simple imagery into complex patterns. Here is a Tutorial on how to create the images.